Ideally located, near to the beach of Palombaggia, very peaceful in the middle of nature. Completely independent apartment with access by the garden, official classification 3 stars. Large terrace with BBC. Recent building. Looked after decoration. Shared swimming pool heated by 36m2 of solar cells. Swimming pool with overflow and panoramic sight on sea, Corsican and Sardinian coasts. Discount for saison. Internet ADSL. "Spacious, clean apartment. All mod cons. 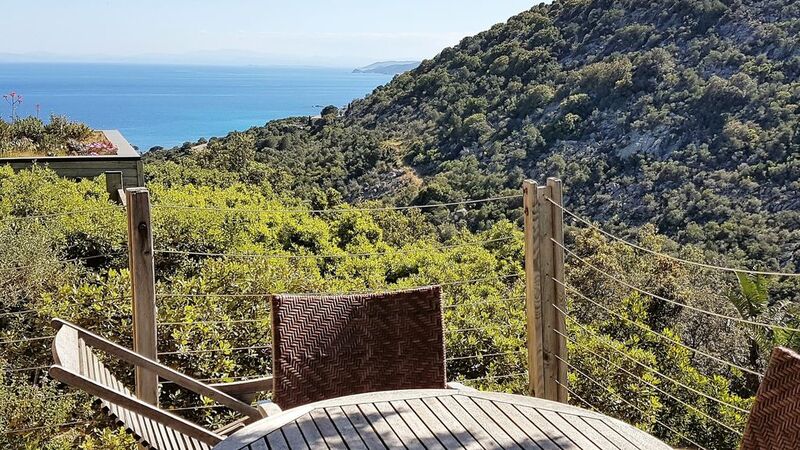 Private terrace with stunning sea and mountain views. Cleverly designed so that others in apartments around can't see your terrace and you can't see their's. Very quiet and secure. Close to beach and some restaurants but we found we needed car all the time - it's very steep! You don't get those views for nothing. Booking process was easy and owner was very helpful at every stage." "The accommodation was lovely: clean and very well equipped, very comfortable, and in a fantastic position with beautiful views. We had everything we needed to enjoy our stay and we hope to return one day." Port of Porto-Vecchio from Maseille(SNCM company). Airport: Figari Sud-Corse at 20mm. Port and Airport of Bastia at 2h15. Port and Airport of Ajaccio at 2h40.